Ginza （銀座、ぎんざ） is an upscale shopping district, and there are many stores that deal in quality and luxurious products. Stores in Ginza crowd on the main street "Chūō dōri （中央通り）" , and a lot of buildings are clustered. The townscape of Ginza that these buildings make is very tasteful, and it shows the charm of Ginza's dignity. 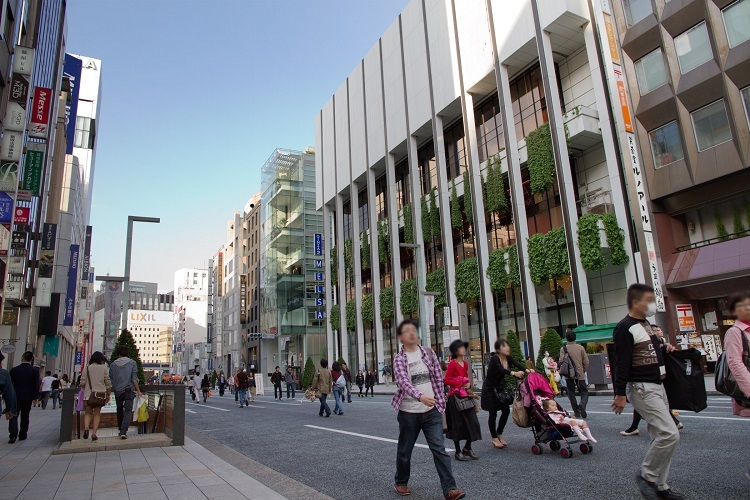 Also, Chūō dōri is shut down to car traffic on Sunday (13:00~17:00), so if you want shopping or taking a beautiful Ginza's picture, we recommend visiting Ginza on the weekrend. On Sunday, the main street is full of people. In Ginza, many long-established stores still open. 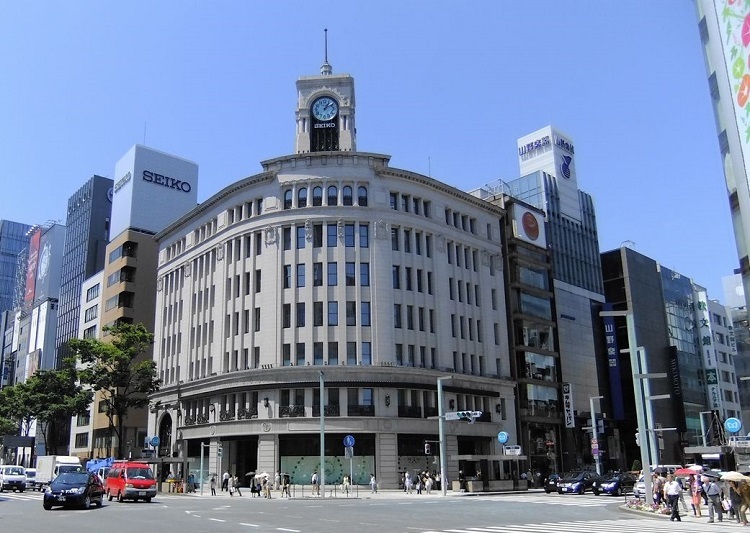 For example, there are 3 huge famous department stores in Ginza, and each stores was open more than 100 years ago, so these stores are treated as the symbol of Ginza. Kimuraya (木村屋) that has sold only ampans (bread roll filled with anko) sincse 1869 is vary popular, so many customers visit this shop from all over Japan. Of course, there are stores that are targeted at young people. Printemps Ginza that is an affiliate in Japan of the famouse department store in Paris offers clothes in fahion for young people and numerous kinds of sweets. Also, there are many branch store of big-name brand (e.g. Cartier, HERMES, PRADA etc...) in Ginza. Moreover, Ginza has a lot of superb restaurants. 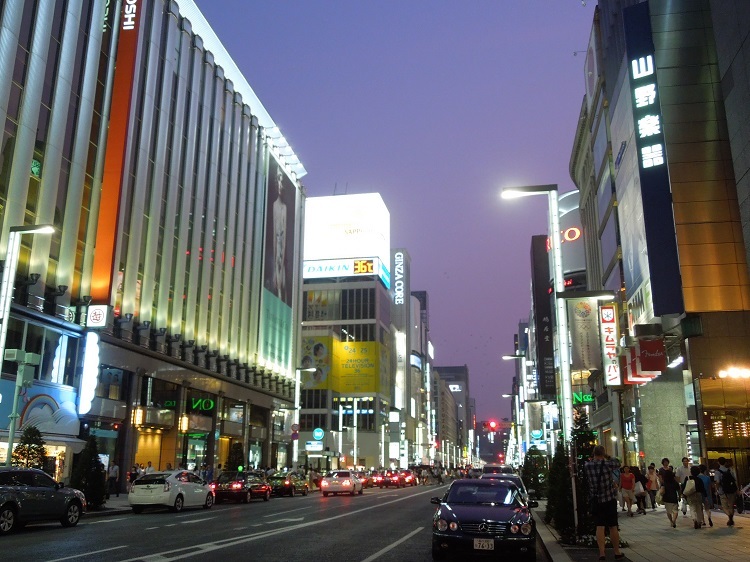 You will see numerous cafes, bars, and restaurants and eat barious kinds of cuisines in Ginza. In addition to this, it is generally said quality of restaurants in Ginza is very high, and there are 22 restaurants in Ginza that Michelin guide gives stars. However, the cost of meals is high. For example, if you want to have a dinner in Ginza (no star restaurants), its cost is nearly 10.000 yen. In case of Sukiyabashi Jirō (the 3 stars sushi restaurants), you needs at least 30.000 yen! You need to see the menue and check the cost before you enter to restaurants in Ginza.